The world gets a little smaller every time an Eagle Scout like Spencer Reeves comes along. The 19-year-old, a product of Troop 70 from New Canaan, Conn., shows how all humans benefit when people from other countries work together. It started with his Eagle Scout service project, where Reeves helped Syrian refugees feel safer and more comfortable in their new homes in Connecticut. He organized a charitable drive and launched an awareness campaign in his community. It continues into higher education, where Reeves is part of the inaugural class at Duke Kunshan University in China. The 266 students in the Class of 2022 come from 27 different countries. Thirty-nine students are from the United States. Of the 14 American men in the class, four are Eagle Scouts. I caught up with Reeves by email to ask 5 Quick Questions about college life overseas, the value of language skills in an increasingly global job market and how he plans to give back to Scouting after college. Bryan on Scouting: What made you consider going to college overseas? Spencer Reeves: When I was looking at schools, I knew that I wanted to study Chinese at a place where I would really learn the language and the culture. I had learned that Duke University was opening a new university in China, in partnership with the City of Kunshan and Wuhan University. So I applied to Duke Kunshan University’s inaugural class, thinking that it would be a unique opportunity but understanding that I would not be able to come home as often given the distance. Once I got in, I was faced with a difficult decision. Ultimately, I decided to go overseas because it would give me a way to get a completely different perspective on things that I already knew about and would be a good way to learn about and experience things that I would never experience in the United States. BOS: What makes going to college in a foreign country unique and challenging? S.R. : One thing that is unique and can be challenging is that English is not at all the dominant language in China. This is really great and helpful for learning the language, because one has to speak it to taxi drivers, shopkeepers, train station attendants, etc. Some people get frightened by that aspect, but it pushes you to learn outside of the classroom. BOS: How do you feel Scouting prepared you for the rigors of college life? S.R. : I feel that Scouting prepared me for college life just as much as high school did. In Scouting, one learns to be able to effectively manage oneself (time, health, workload, etc.) and be able to physically navigate oneself (and others) through a new place. 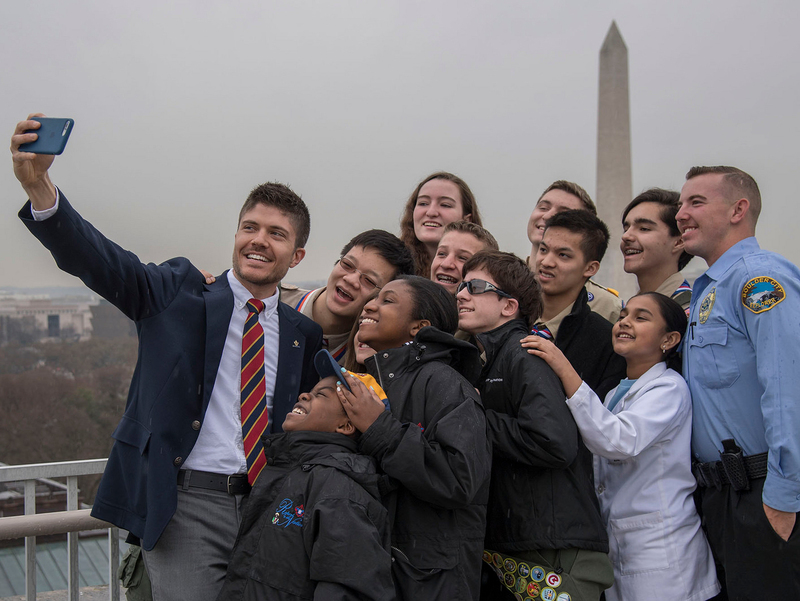 BOS: Scouting is worldwide, so what skills does a young person learn in the BSA that might prepare them for a job in an increasingly global marketplace? S.R. : I would say the skills that we learn in the BSA transcend national borders. Things like leadership, communication, kindness, helpfulness toward people, respecting those senior to you, organization — these are all things that are respected worldwide. As long as you fulfill your role in Scouting, you are preparing yourself for the global world — though it may be helpful to pick up some language skills along the way! BOS: What’s your plan after graduation, and in what ways do you plan to give back to Scouting? S.R. : These days, the world changes so quickly, so what I want to do today may be different two months from now. While I am just trying to keep my options open, I am very interested in how different people and cultures use various forms of technology — particularly the technology of cars, as they become more connected into peoples’ lives. I do hope, wherever I live, to find a Scouts BSA troop to become involved with. I hope that, when I have kids of my own, I will be able to go through Scouting with them.